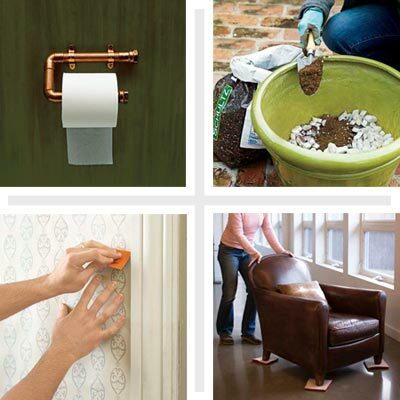 With a little creative repurposing, you can breathe new life into many common household items—including those destined for the trash heap. These clever recycling tips, are good for the planet and your wallet, too. Place charcoal, in open bowls or perforated plastic bags, in your fridge or drawers to banish odors. Cut a hole in a lid large enough for a paintbrush handle. Slip the handle through the opening, and paint mess-free. Soak gunked-up nylon brushes in hot vinegar for up to 30 minutes to remove paint and soften the bristles. Afterward, wash them in hot, soapy water, brushing off paint as needed, then rinse and let dry—good as new.